Manejo de Ranchos cinegeticos: por donde empezar? Sandra Rideout-Hanzak, Jorge G. Villarreal Gonzalez, David Hewitt, Randy DeYoung, April Ann Torres Conkey, J. Alfonso Ortega-S.
Poncho Ortega and the rest of the CKWRI Deer Research team have a long history of supporting deer management and research in northern Mexico. This support has been in the form of annual presentations at landowner symposiums, visits to ranches interested in developing management programs, and a recent effort funded by the US Fish and Wildlife Service and headed by Sandra Rideout-Hanzak to engage ranchers in northern Mexico. 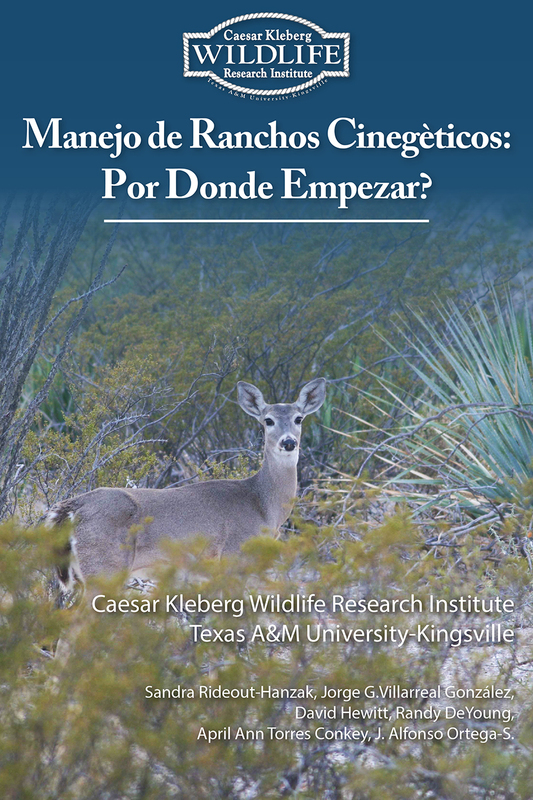 This most recent project brought landowners to Kingsville for workshops, CKWRI deer scientists to northern Mexico to tour ranches, and was capped by publication of a wildlife management handbook written in Spanish for distribution to Mexican ranchers. The book covers the basics of cattle-wildlife operations: management plans for determining objectives of the operation, vegetation and wildlife surveys, habitat management practices, record keeping, monitoring, and wildlife harvest quotas. At the end of 2015, Randy DeYoung and Poncho Ortega were invited to speak at the Annual White-tailed Deer Symposium in Monterrey, Mexico.